"A quick and easy party treat! Pretzels coated in peanut oil and dry salad dressing mix. Use any flavor salad dressing." In a large bag combine pretzels, peanut oil, salad dressing mix and salt. 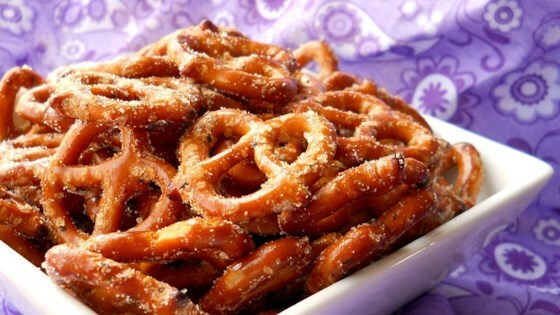 Shake bag to coat pretzels. Not sure how this made it into the low carb section, 15oz of pretzels has just over 327g of carbs probably need to adjust your nutritional info. I make pretzels similar to this, but my recipe calls for baking them in the oven on 275 degrees for 45 minutes and stirring them every 15 minutes. The oil will absorb then. Like... SO EASY! I am rating the recipe 4/5 stars, only because I reduced the amount of oil to 1/4 cup. The finished snack was salty, zingy, not too greasy, and required no baking. Thumbs up!